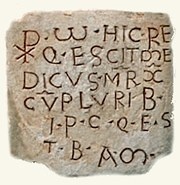 According to Eduardo D’Angelo (referenced below, at p. 134, the inscription can be dated on palaeographic to the 10th or 11th century, while the formula used suggests that it was a copy of an earlier text. This suggests that the remains of St Medicus and the many other ‘martyrs’ nearby had been discovered but left in place for some 700 years before their rediscovery in 1611. A legend (BHL 5877), which is probably from the same era as the inscription and which clearly derived from that of SS Victor and Corona, records the martyrdom of St Medicus by the dux Sebastian in the reign of the Emperor Marcus Aurelius. He was beheaded outside the city gate and buried in a crypt with many others by a man called Lozimus. “... under the tribune of San Vittore was found in fact a travertine sarcophagus containing some bones and an inscription that recorded the burial of St Medicus and other martyrs of Otricoli. ... [soon after], other burial sites were found, excavated out of the tufa and closed by tiles. Furthermore, a a staircase cut out of the rock led to a subterranean grotto under the tribune of the church, its walls decorated with red and black crosses that had 57 burial niches below, again closed with tiles” (my translation). “... what emerges clearly is that this was a funerary gallery [catacomb], which is unusual in Umbria, found at only one other place, Villa San Faustino, Massa Martana” (my translation). Ludovico Jacobili (referenced below) recorded that Bishop Giovanni Battista Toschi translated the relics to Santa Maria Assunta in 1612, and that they were placed in a chapel that was built for them in the crypt. (In fact, the original crypt had been enlarged for its now purpose). The relics remain under the altar there, and the inscription is on the left wall. Return to the page on Saints of Otricoli.